Fantasy settings commonly have a magic system of some sort. It is often well-thought out and organised and more-or-less reliable. I’ve heard of authors writing themselves a “bible” about how it is supposed to work so that they don’t make mistakes. Most of the magic in Harry Potter is reliable and repeatable, for example. Harry’s trademark Expelliarmus always fires. Fred and George’s joke candies always work. Yet the need to practice and perfect it is mentioned a lot of the time (it is a school, remember). And we also see the edges of an organised study of what magic can do. A major section of The Ministry Of Magic is for research, after all. And Dumbledore frequently talks about what they don’t know magic can do when talking to Harry about Voldemort. The magic in most Dungeon and Dragons settings is reliable, too. I think this is because the settings inherit a game system because players use magic very frequently, either explicitly (like if they’re a wizard) or implicitly (a weapon or even a skill). Adding a reliability check to all magic in DnD would slow things down a lot. In the novels, it is common for a master thief to have an arsenal of magic objects, and they almost always function as designed. There are sometimes multiple magic systems. Lyndon Hardy did this with his novel The Master Of Five Magics. Each is separate and a major piece of the world economy is built around them. In fact, a major industry is built around training for each magic. The whole story is about someone who sets about being trained in all of them, which is unheard of. With so many magic systems, Hardy created a structure for them all, and rules for each of them. He did this so well that with his sequel, The Secret Of The Sixth Magic, he could create a meta-magic system that describes how they could be changed. Both novels have been praised for creating such an organised description of magic. The magic in Terry Pratchett’s Discworld is more than a bit organised, too. The wizards of Unseen University are a lot more like scientists than practitioners of nefarious arts. In the later novels, we have everyday devices powered by magical means: cameras and personal organisers are the visible two Pratchett has fun with. Each have a tiny demon running things inside them and they are mass-market products. This magical-being approach is even lampshaded right in the first novel when Rincewind is given Twoflower’s camera to operate. He knows that there are certain chemicals that react to light and he begins wondering how to get from there to a functioning camera. At that point, the tiny demon inside Twoflower’s camera opens the access hatch for the first time to tell him that he’s run out of pink paint. Pratchett even lampshades this in the large with four whole books that he co-authored with two scientist friends, beginning with The Science Of Discworld. These use the fictive construct of the wizards and their world to explore the sciences of our own world. And I mean “sciences” in a very broad sense of the word. Early excursions look at nuclear physics and cosmology, but later ones look at social sciences like narrative history, and how belief shapes our thinking. This takes us back to where magic exists in our own history. And that is usually spirituality and religious practice. I know enough about both to recognise that neither are treated very much like science, though. Praying to a deity is common in both the real world and in fantasy settings. In most fantasy settings, it is often like a magic spell: you say the right words and the deity automatically grants the supernatural effect you’re seeking. Except when they don’t because the plot requires it. And this also doesn’t work in the real world, either. It would be news all around the world if a Catholic Cardinal in the Vatican could reliably and repeatedly summon a fireball by prayer. One of the allures of fantasy novels is, of course, reading the characters doing the impossible. Particularly in an analogue of our own world. This is one reason the Harry Potter novels are so popular. Who wouldn’t want to be able to wield magic with a simple stick of wood in their home or workplace? Except if lots of other people have one, too. And Hogwarts does teach a lot of offensive magic. There are some fantasy worlds where magic is rare. I built one for a gaming campaign, yet only one player really grasped what that meant for playing. It was at least three sessions before they had access to magical healing, for instance. Settings where prayers (usually) don’t do anything, yet those who pray think they do are also rare. The Dragonlance novels had a period where that was the case. This was because the gods had deserted the world for a period of time, and people were calling to new gods that did not actually exist. So how reliable is the magic in your fantasy worlds? I may as well say right at the outset that whilst quality world-building is a great thing, you can have too much of it. A number of years ago, I bought and read a fantasy series by a new author. An Australian imprint was looking for someone to spearhead their fantasy publishing down under and had found someone to publish. This was before the rise of ebooks, note. It is probably just as well I don’t remember the author’s name because the books were atrocious. My enduring memory was how little characterisation there was. Like most epic fantasy works, there was a great deal of magic, adventuring and gods dabbling in the affairs of men. But the story was dry as dust. The world was interesting, the magic system fairly original, but everyone was a cardboard cutout of a cliched idea. It was difficult to discern anyone’s motives and most of the action was mechanical. In other words, characterisation was sacrificed for world-building. You wouldn’t be surprised to know I’ve long since gotten rid of those books. More recently, I started reading another epic fantasy novel by a much more well-known author. Like most in the genre, there was a prologue filled with characters that I did not expect to see again and narrating events I would expect to be only referenced in legend in the rest of the story. So far, so good. The first real chapter started with some action – a somewhat mysterious assassin was at work, fighting off mooks as he sought his target in a place he didn’t really know. Completely tropish scene, clashes of culture driving action and interaction, plenty of opportunity for small info-dumps about the world. Which the author took. The assassin has a few magical skills unusual in the culture of his quarry and us readers were treated to quite detailed descriptions of how it worked. There was a warning there, I think. Because it turned out it was a second prologue. The next “chapter” was with another set of characters in a third location. And more world-building. The chapter after that did it again! But this time – finally – there was one character in common. His circumstances were vastly different, however, and I nearly didn’t recognise him. But then it happened all over again with the next chapter! This novel has a lot of world-building. A lot. Maybe too much. Arguably too much to throw at the reader at this point in the novel. It’s all quite interesting, but I’d much rather have characters I can get to know instead of introducing them and then putting them on a shelf for a little while. It makes for a read that doesn’t engage me as well as it could. And no, the novel I am describing is not A Game Of Thrones, although that work has also been accused of the same problem. The book I am referring to is The Way Of Kings by Brandon Sanderson. I’ve seen other authors do the same: as well as George R. R. Martin, Peter F. Hamilton comes to mind. His space opera The Night’s Dawn Trilogy does the same thing: multiple interleaving threads, scads of major characters and an immense amount of world-building. But Hamilton makes it work. The characterisation he lends his characters is a match for the world-building and the action moves at a solid pace. I don’t feel Sanderson is giving his characters enough room. However, it is early in the novel and this problem may sort itself out. But I still maintain that world-building can crowd out characterisation. It’s not a good idea to let that happen. The Edges Of World-Building: Water. Most, if not all of my readers will be accustomed to having clean running water readily available to them. Kitchen, laundry, bathroom, garden – the supply of water in developed countries (especially urban and suburban areas) is almost universal. This loose series of blog posts has, admittedly, a bit of a focus on fantasy world-building, as that’s my preference. And a lot of fantasy fiction has the European middle ages as its basis. And during that time and for quite a long time afterward, clean drinking water was not a sure thing. Whilst it made sense for a single town to pull water out of the river on the upriver side and put their sewage in the downstream side, what about the next town down the river? And the next? When the colony of Sydney was founded, we had this kind of problem. There was a nice clean stream flowing down into the harbour that was quickly overrused. People were trying to pull water out of it right next to where others were putting waste into it. Within a few decades, the first of a series of increasingly large engineering efforts to secure clean water for the burgeoning colony were begun. The Tank Stream now runs in a tunnel underneath the heart of the CBD and most of Sydney’s clean water comes from an large dam some fifty miles or more to the west. But this isn’t a feat of industrialised society. 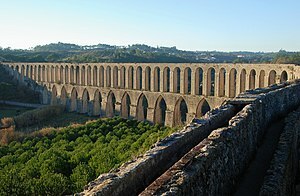 The Romans were widely lauded for their aqueducts capable of transporting clean water many miles to their cities. Rome alone had more than half-a-dozen aqueducts delivering water to the city. Importantly, the Romans had programs for maintenance and repair and prided themselves on their public baths. Yes, public baths. Household plumbing was likely beyond the Roman’s ability, and possibly beyond what they could imagine. But their whole society viewed personal cleanliness and privacy quite differently to our current western secular society. Of course, in an invented world, you can create as much or as little of this as you wish. Quite how your fantasy world gets its water to those who need it isn’t necessary to describe or even design in detail. However, you probably should be aware of it. A city of two millions souls with huge public fountains and baths would work situated in a fertile landscape within a hundred miles of snow-capped mountains. The same city would ring false situated on a desert coast with no river in sight. Unless you had designed some magical source of water (it has happened). Likewise, how water is made available to your world’s characters can drive the story. Public baths can be could for cladestine meetings and illicit hookups in ways that could be quite different in today’s world. The frequency of bathing could be a plot point. Amongst other things, it has an effect on how often they change their clothes. Or wash them. Or cook. The cottages of Lancre in Terry Pratchett’s Discworld, if they have an indoor pump will have it in the scullery. This contributes directly to the house design: the washing is done in one room, but the cooking is done in another. This is world-building in the small. Where your water comes from has a subtle and powerful influence on how a world works. And I’ve barely touched the subject. There was some writerly advice I saw many years ago about describing your scene in creative ways. Whoever it was said to be aware of what is normal to your characters and describe things appropriately. The example given was on a spaceship: say “The door irised open” and there is some instant colour and description all in one neat little package. After all, there is no reason the characters in your scifi setting could not think that a door “irising” open is anything but normal. That tiny example re-purposes the word “iris”. What is easily forgotten is that words are re-purposed around us all the time. How many of you know what “blog” means? I mean really means? It came from the phrase “web log” which came about to describe people logging a journal on the world wide web. Over time, it’s been shortened. One thing that usually comes up in invented fantasy worlds, even if just in passing, is the need to exchange money for good and services. Rare is the story where you can focus on a strange way to do it – most of the time is it little more than colour. Worlds based on Dungeons and Dragons usually have “gold pieces” as the core value (often abbreviated to “gp”) plus lesser values in silver and copper. Which is kind of ironic because the original idea of “gold piece” was so that game writers could create some local colour by changing the name. Many don’t, of course. It also ignores some of the economic history of our own world. In medieval Europe, which is the basis for a lot of fantasy fiction world-building, the average man-in-the-field never ever saw gold in his entire life. Gold was rare and thus highly valuable. Too valuable, in fact: silver was much less rare and so many coins were struck in silver. But even a single English silver penny was worth a lot: Wikipedia tells us that estimates of its equivalent value in today’s terms is something like $20. That tells us that a lot of local trade wasn’t transacted with money. No wonder few people ever saw gold. David Eddings is on record as saying that when he designed the world of The Belgariad, he chose a pagan pantheon because it was more interesting than a christian one (“pagan” just means non-christian, by the way). By that, I imagine he meant he preferred a multitude of gods in his world rather than one single one. For the sort of fantasy world he built, one god was just not going to work.